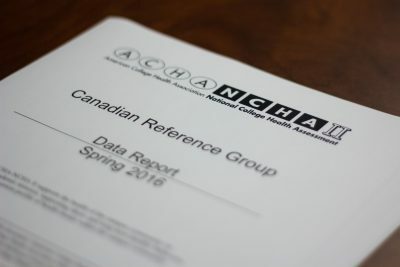 At least one in 10 women at TRU have had a non-consensual sexual experience according to data from the 2016 National College Health Assessment (NCHA). The data shows a 3.6 point increase from 2013 to 2016 in self-reported incidents of sexual touching without consent among women, as well as smaller increases in other categories. Results for men were largely unchanged over the same period, with 5.9 per cent of men reporting incidents of sexual touching without consent in 2013 to 5.6 per cent in 2016. Incidents of sexual penetration attempts, sexual penetration and stalking went largely unchanged for men. For women, however, incidents of sexual penetration attempts without consent went from 2.2 per cent in 2013 to 4.8 per cent in 2016. Reports of stalking also increased, going from 8.1 per cent to 9.7 per cent. All survey questions asked students to report incidents from the past 12 months. The 2016 survey was conducted in March and was sent to all TRU students. It was open for 20 days and students who completed the survey were eligible for four cash prize draws with prizes ranging from $50 to $200. TRU saw a 17.5 per cent response rate in 2016, down from 18.9 per cent in 2013. The national average response rate for 2016 was 19 per cent. The one in 10 figure was no surprise to TRUSU women’s representative Sierra Rae. “From what I know of sexual assault and how common it is, that makes sense. It’s honestly terrible to look at that and say that’s what we have and what women are expected to have – basically a 10% chance of having been assaulted. That’s not cool, to say the least,” she said. The figures at the national level were even worse, according to the 2016 NCHA group data report released at the beginning of September. That report shows that 13 per cent of women indicated they had been sexually touched without their consent in the 12 months prior.